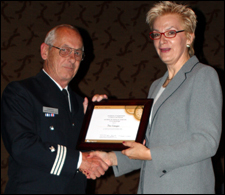 Six individuals and organizations from across Canada were honoured for their outstanding contributions to Canadian search and rescue efforts with the distribution of the 2004 Certificates of Achievement from the National Search and Rescue Secretariat. Amongst others, Don Limoges, District Director, CCGA C&A and John Palliser, Regional Supervisor, Marine Search and Rescue, Canadian Coast Guard (Pacific) were each presented with a Certificate. For more information, consult the Web Site of the National Search and Rescue Secretariat.